Are you looking at a crumbling or cracked foundation? While foundation cracks generally signal signs of foundation damage, they may also indicate other things based on the size and shape of the crack(s), as well as the materials used in the construction of your foundation. Major cracks can cost thousands of dollars to fix while minor cracks are far more affordable to repair. So, what kind of cracks are you looking at? An expert can uncover the severity of foundation damage largely from collecting answers to the following questions. 1. What type of material is the foundation made from? Cracking or crumbling can signal unique issues based on the type of material a building’s foundation is made from. For instance, concrete, concrete block, wood, etc., crack differently and for unique reasons. 2. Is the foundation moving? Is the foundation currently active and moving? The foundation can move in several ways including bulging, leaning, settling, bowing, bending, and so forth. It’s important to determine if, how much, and in what direction the foundation is moving. 3. What do foundation cracks look like? Cracks come in a variety of patterns and shapes, which can be rather telling. Cracks can be horizontal, vertical, stair-stepped, or diagonal. The location of cracks is also important. For instance, cracks beneath windows, near doors, or at stress points are often associated with larger foundation issues. 4. Are cracks changing or growing? It’s important to take note of how cracks have changed or grown, and at what rate these changes are occurring. By assessing the answers to these questions, an expert can determine how severe the damage is and what the best solutions are. Cracks in bricks: Older homes made of solid brick may have a brick foundation. Cracks in brick typically signal movement of the structure, thermal expansion, or an issue with support. Concrete block foundation wall cracks: Concrete block shrinks during the curing process. Although, once set in place, concrete block rarely expands due to moisture or temperature fluctuation. Shrinkage cracks are often found at the center of a unit, as the corners tend to be the strongest area. They are usually uniform in width. Poured concrete shrinkage cracks: Shrinkage cracks can result during the construction phase due to a poorly-made mix, a rushed curing process, or other undesirable conditions. Shrinkage cracks are not usually a big cause for concern and don’t always require repairs. Cracks in stone foundation walls: It’s not common to see cracks in individual stones, but you may notice bulging or cracking throughout the layout of the wall. Common causes relate to frost damage, overloading surfaces near the wall—for instance driving vehicles too close to the foundation; or, removing stones to install piping, make doorways, etc. When are Foundation Cracks Considered Dangerous? Structural brick walls with cracks could turn serious if the bond courses break, in which case it’s possible for complete structural collapse. 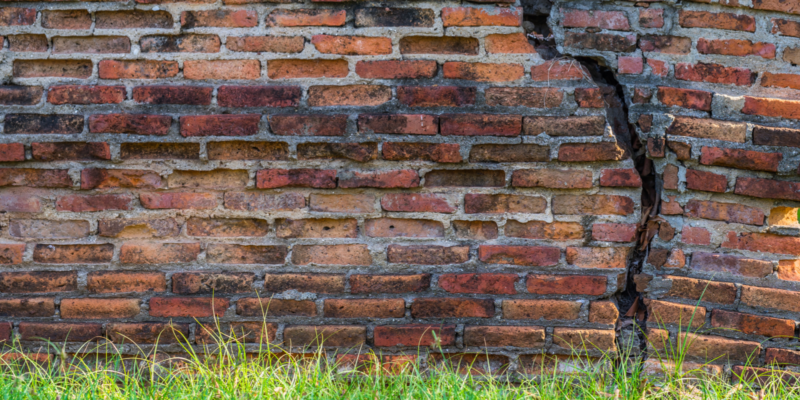 If you notice cracking or bulging brick walls, call out an expert as soon as possible. Check the top of your home for cracks near window frames, and in brick homes look out for stair-stepped cracks on the outer walls. Horizontal foundation cracks may indicate too much water pressure beneath your home. Will Parging Fix the Problem? Parging offers a way to fix cracked or crumbling foundation walls, but it cannot fix serious foundation issues. It’s more of a Band-Aid that improves aesthetics. And, in some cases, the parging turns out to be the problem. Parging is a coat of cement-based mortar applied to foundation walls to improve appearances and, in some cases, increase longevity. The problem with parging is that it tends to be more of a temporary solution and can start to look bad in a relatively short period of time. That’s because it is sensitive to moisture and freeze/thaw cycles. Depending on the level of degradation, there are different possible solutions. In some cases, painting over parging works. More severe damage to parging may involve removing it completely and then painting the block wall. No matter what your Toronto foundation requires, we are trusted to find the most cost-effective long-term solution. Contact us today to ask questions or get a quote!